Dragon Coupon is yet another adware program that is based on the JustPlugIt engine. Adware programs such as Free2you, TakeShop, Friday Frenzy, and quite a few others also rely on this engine. Thus, it is not at all surprising that Dragon Coupon should be removed as soon as it is detected on your PC. 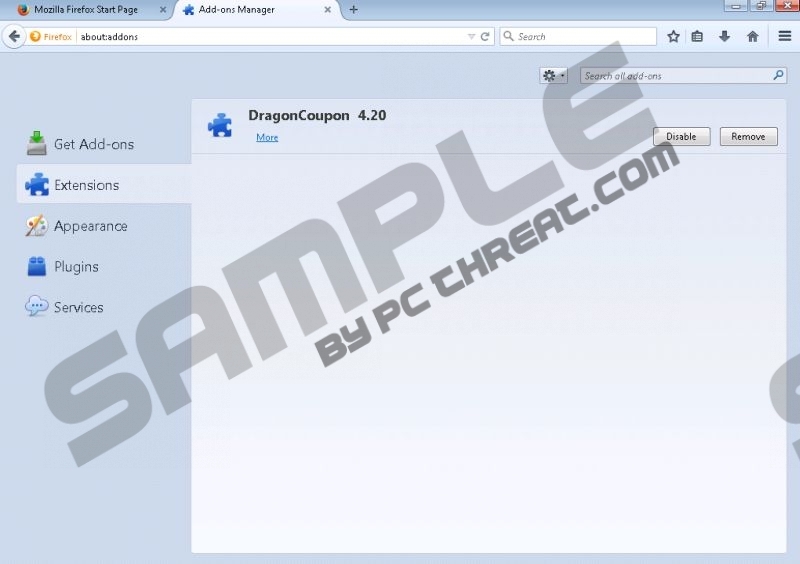 Just like any other adware program, Dragon Coupon will present you with ads and pop-ups. Unfortunately, it has been discovered that some of them could turn out to be malicious. Do not take any chances with this intrusive adware program. If you wish to keep your PC clean, secure, and fully functioning, removal of Dragon Coupon is a must. Use the removal guide provided below and delete Dragon Coupon immediately. Just like any other adware program based on the JustPlugIt engine, Dragon Coupon will present tons of adverts within your browser as soon as it is up and running on your operating system. All the adverts and pop-ups will be presented randomly whether you like it or not. It will make surfing the web an annoying and infuriating task, to put it mildly. In addition to that you should note that all the advertisements powered by Dragon Coupon are utterly worthless; thus, there is no point in clicking on any of them. Even if some of the adverts may seem tempting, refrain from clicking on them as they could expose your PC to suspicious web content. During the research it has been discovered that some of the Dragon Coupon adverts could contain redirect links. This is alarming, since just by clicking on a single advert you could end up on some of the most suspicious websites out there. You could land on a website running an arbitrary code execution exploit, meaning that just landing on such a website is enough to get your PC infected with some unknown Internet-based infection. It should be quite obvious why removal of Dragon Coupon is essential. Do not hesitate. Remove this worthless and potentially dangerous program once and for all. Execute manual removal with your utmost attention, as just one mistake could mean that some traces of Dragon Coupon are still active. It is paramount to remove every bit of Dragon Coupon because only a few files or registry entries could trigger a silent restoration process. We strongly recommend analyzing your PC for any potential leftovers within the registry system in order to make sure that the infection is removed entirely. Otherwise, you should use a reliable antimalware tool for all removal processes. Double-click Dragon Coupon to remove it. Select Control Panel then click Uninstall a program. Quick & tested solution for Dragon Coupon removal.